Long-time corps de ballet dancer grew up through the PNB School. Final performances in Coppélia, AMERICAN STORIES, and Season Encore. SEATTLE, WA — Pacific Northwest Ballet Artistic Director Peter Boal and corps de ballet dancer Jessika Anspach have announced that Ms. Anspach will retire at the end of PNB’s 2015-2016 season. A true “PNB baby,” Ms. Anspach literally grew up dancing at PNB over 26 years, first in classes at PNB School and then with the Company. She took her first PNB School Creative Movement dance class at the age of five in 1990, joined the company as an apprentice in 2004 and was promoted to corps de ballet in 2005. “My life with Pacific Northwest Ballet has been a dream come true,” said Ms. Anspach. “I still remember being a little girl at a performance of Nutcracker, sitting in a red velvet theater seat, and with eyes wide, saying ‘Mommy, when I grow up that’s what I want to do.’ I have never wanted to dance for any other company, and I feel privileged, honored, and blessed to have called PNB my home – and everyone there my family – for 26 incredible years. I cannot thank each and every one of my coworkers enough for their love, support, encouragement and tireless commitment to this company. From the teachers who refused to write me off as an uncoordinated, dyslexic child, to the seamstresses who make me feel beautiful and comfortable in whatever I wear on stage, to my fellow dancers who inspire me in class and onstage, to the pianists and orchestra members who play the music that gave my heart and feet wings, to the directors and ballet masters who pushed and pulled the artist and technician out of me, to the audience that supports us all with their love and commitment to beautiful ballet performances: I owe them all so very, very much. on Jessika’s blog – justJessika. Audiences will have several more opportunities to see Ms. Anspach perform during the 2015-2016 season, including the upcoming Coppélia (April 15 – 24), and AMERICAN STORIES (June 3 – 12). The season will conclude with PNB’s annual Season Encore Performance (6:30 pm on Sunday, June 12). Tickets to Coppélia, in addition to the rest of PNB’s season offerings, may be purchased through the PNB Box Office, 206.441.2424, online at PNB.org, or in person at 301 Mercer Street. Tickets to the Season Encore Performance are on sale now for PNB’s season subscribers only, and will go on sale to the general public on April 8, 2016. 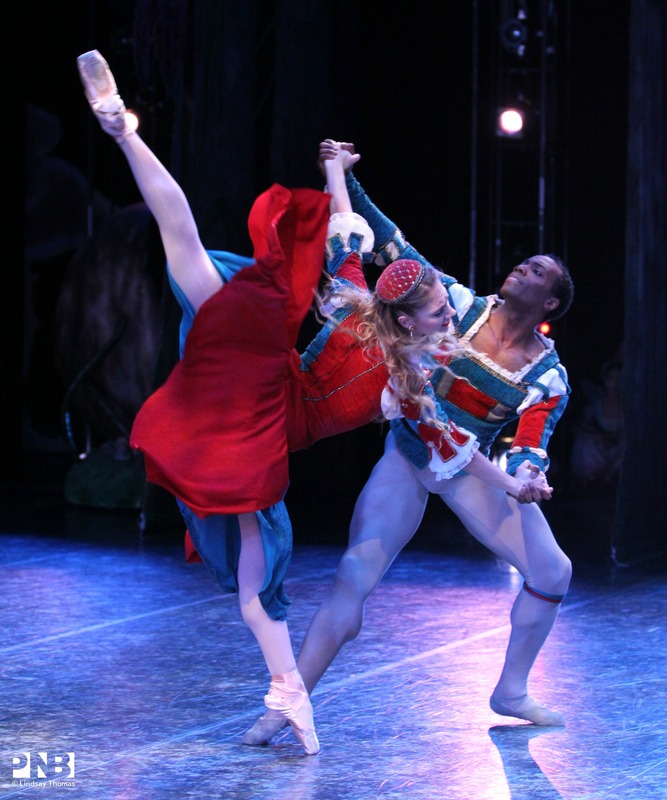 George Balanchine’s Coppélia runs April 15 – 24. AMERICAN STORIES, featuring Jerome Robbins’ Fancy Free, George Balanchine’s Square Dance, and Twyla Tharp’s Waiting at the Station, runs June 3 – 12. Season Encore Performance will be presented one night only, Sunday, June 12 at 6:30 pm. The program line-up will be announced soon. NOTE: Tickets to the Season Encore Performance are on sale NOW to PNB’s subscribers, and will go on sale to the general public on April 8, 2016. Tickets may be purchased by calling the PNB Box Office at 206.441.2424, in person at 301 Mercer Street, or online at PNB.org. Programming and casting are subject to change. For further information and casting, please visit PNB.org. Ms. Anspach has performed leading roles in George Balanchine’s Agon, Coppélia (Spinner), and A Midsummer Night’s Dream (Helena); Ulysses Dove’s Vespers; William Forsythe’s One Flat Thing, reproduced; Marco Goecke’s Place a Chill; Ronald Hynd’s The Sleeping Beauty (Fairy of Wit); Mark Morris’ Kammermusik No. 3; Kent Stowell’s Cinderella (Stepsister) and Nutcracker (Peacock); and Susan Stroman’s TAKE FIVE…More or Less. She originated a leading role in Andrew Bartee’s arms that work, She has danced featured roles in Balanchine’s Diamonds, Divertimento from “Le Baiser de la Fée, Serenade, and Symphony in C, Jiri Kylian’s Sechs Tanze (Six Dances), and Kent Stowell’s Cinderella, Silver Lining, and Swan Lake, and originated corps roles in Kiyon Gaines’ Sum Stravinsky.